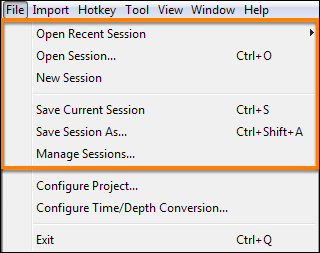 The File menu in the Control Panel includes commands to manage sessions and configure projects. In the Control Panel, go to the File menu. Click the different menu options to manage your session. For more information, see Using and Managing Sessions. When you have launched a project in Insight, you can change the project settings including the Coordinate Reference System (CRS), X/Y unit and the latitude/longitude of the project. Note: Follow the steps described in Creating a Project or Configure a Project to change the project configurations. To perform time/depth conversion for the project, you have to first configure the conversion settings. In the File menu, select Configure Time/Depth Conversion. For more information on time/depth conversions, see Converting Time-Depth and How it Works (Time-Depth Conversion).